All of the sites featured in this ever expanding list have been used with success and come highly recommended by the Creative Tallis Action Research Group. If you have suggestions about other sites we haven't yet discovered, please get in touch. This is a great mindmap representing a wide range of web 2.0 tools categorised by function. Some of the tools identified below are featured but not all. Unlike those below, we can't claim to have used all of the tools referred to in the mindmap. However, it illustrates the growing number of online applications that can provide innovative ways of engaging young people in learning. If you try something that we haven't reviewed below and you think it's good, let us know and we'll feature it. Even better, send us a link to an example of something you or your students have created. Click to spin the wheel and generate a unique three word phrase to spark your creative thinking. You can also get a free version as an iPhone app. A really intuitive tool that allows you to create animated movies in minutes by simply typing the script, choosing characters and backgrounds and selecting camera angles. Great fun! If you're working in a team it often makes sense to keep track of everyone's contributions and important deadlines. This simple project management tool is a great way of creating a clear timeline for your joint efforts. This timeline tool is really easy to use and provides multiple layers. This would be a great way of demonstrating a relatively complex history containing several strands. This process is of course ideal for classroom use as it helps students develop their Thinking Skills, reasoning and critical thinking in a highly visual format – great for demonstrating understanding. You can also purchase printed versions of various maps. A visual search engine for the web pulling in content related to your keyword from a huge variety of sources. If you have a Twitter account you can broadcast live to the world using this simple application. As well as a live video feed there's the opportunity to tweet to your followers. A really straightforward voice recording service for simple podcasts. Wallwisher is an online noticeboard. Collaborate on a class noticeboard or keep your own wall of stickies and embed in your website or blog. You might also want to check out Stixy which provides a similar service. Broadcast live on the internet from any mobile phone absolutely free! An amazing service that could be used for a variety of creative projects from a class radio station to field notes. Very clever! Capture whatever is on your desktop as a movie with this simple application. Then simply upload to YouTube or a similar service and embed in your website or blog. Another great resource for Creative Commons sound effects. A huge library of sounds for just about any project. Realtime, collaborative word-processing. A no fuss solution to creating documents with classmates and colleagues. Prezi is a really exciting application that allows you to create animated multimedia presentations quite unlike the traditional slide based tools like Powerpoint and Keynote. Click here to see an example of one in action. Tonematrix is a simple sinewave synthesizer triggered by an ordinary 16 step sequencer. Each square corresponds to a single tone. Quickly build complex sequences of sounds by simply highlighting squares on the grid. This is a brilliantly addictive musical resource. If you're looking for even more synthesizing fun, check out the Audiotools from Hobnox. Straightforward but reasonably sophisticated online animation studio. Choose from a range of characters, backgrounds , actions and emotions. Create a series of frames to construct your story. Upload your own photos and sounds or choose from others online. Very clever! Pixton is a simple to use online comic strip creator. The finished comic can be embedded as an interactive document in a website. You can even turn your comic into an animated movie by adding key frames. A great collaborative mind mapping tool that is easy to set up and use, free and flexible. 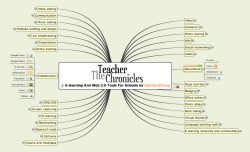 One of the better online mind mapping applications out there. A fun and easy way to explore any topic by harnessing the power of group thought. This site allows you to create a timeline featuring information from a variety of sources including blogs and social networking sites. We use it to pull together our blog posts, tweets and Flickr images into a single, constantly updated, interactive timeline of activity. Cool! A set of image editing applications that's almost like having an online Adobe Creative Suite. Incredibly powerful and currently containing an image editor, a vector editor, a visual laboratory and colour swatches application. More exciting applications to follow including an audio editor and painting simulator. Amazing! Want to create animated online versions of your documents that you can embed in your website or share via email? If so, Issuu provides you with the best self-publishing facility you could imagine. It's quick, free and easy to set up an account and you'll be amazed at how good your documents look online. Like Issuu, this site enables you to upload multi-page documents in a variety of formats and converts them into interactive, animated online books. You can choose a suitable background and even link to a page turning sound effect for extra authenticity. Create virtual scrap books with this easy to use, drag and drop design application. Use a combination of stickers, backgrounds and photographs to quickly produce attractive publications that can be embedded into websites and shared with others. Integration with Flickr makes this a breeze! A very useful, free web application that allows you to create drag and drop interactive, multimedia posters. Great if you need to collect a lot of visual and multimedia information in one place and make it look exciting. An online diagram designer for professional looking flowcharts, plans and technical drawings. Easy to use. Copy a chunk of text into Wordle and instantly create a word cloud based on the frequency with which words appear. This is a great way to analyse use of language, especially in long, complex documents. Share your slide presentations online using this great social networking site. Now all you need is an internet connection to access your presentations from any computer. Presentations can also be embedded in websites for others to view. A whole online office suite of collaboration and productivity applications. A great way to share conversations about your media - photos, videos, documents or audio or any combination of them. Click here to check out the VoiceThread walk through. A collaborative online whiteboard application that allows a number of people to draw on the same surface simultaneously. Great for joined up mind mapping exercises. Another great real-time collaboration tool that includes voice and text chat. Ready made thinking guides to suit any thinking activity. A no set-up meeting tool that allows live annotation of a web site. Want to think through a project idea but need a little help? This application might be just what you need. Vuvox is an amazing multimedia slideshow and collage creation tool that's a doddle to use but produces great results very quickly. You can upload images and sounds to the site or grab them from your online albums in Flickr or Picasa. Yola is another great free website building application. It is similar to Weebly in its functionality and ease of use. Don't worry if you don't know anything about web design. You'll have a site up and running in no time. Easy to use website building tool. It's how we made this little beauty! Create and solve anagrams on this small but beautifully formed site. An online version of the famous fridge magnet game. A really cool online community drawing tool. Create a free talking avatar for your website or blog. Collaborate online with this infinite virtual corkboard. Great for collecting notes and ideas with a wide variety of participants.